A bit of BPotD news before today’s entry: we finally have a date and time set to transition the web site over to the new server. It’s been a real headache for months, but hopefully the pain will be over by mid-week next week. On Monday @ 10am local time, we’ll start to move the site over. Unfortunately, since we’re also moving to a new server, the web site domain name needs to be pointed to the new server, and that means it may be a couple days before you are able to access content on the new site while the name propagates to the various Internet Service Providers. The old site will still be running for a few days, but comments will be turned off. Fingers crossed that all goes well! The last time I featured a Parnassia on BPotD (over 5 years ago: Parnassia glauca), I wrote that the genus had been moved out of the Saxifragaceae (you’ll see that in many classification systems) and even out of the Saxifragales (the order containing the Saxifragaceae and related families) and into the Parnassiaceae (within the Celastrales). A number of research groups have since studied the relationships between Parnassiaceae and Celastraceae; current thought provisionally places Parnassia within the Celastraceae, but it seems (after reading the Phylogeny section on the linked page) that this may yet revert to being split again. 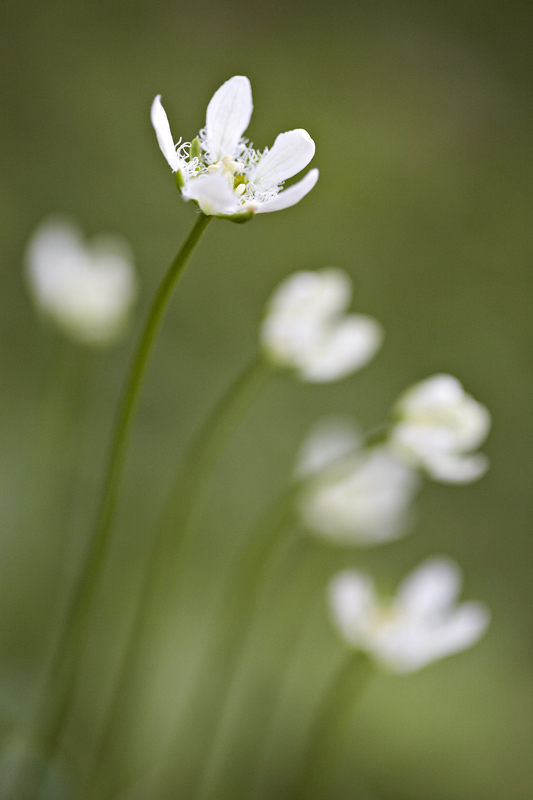 This August photograph of Parnassia fimbriata (fringed grass-of-Parnassus or Rocky Mountain grass-of-Parnassus) was taken only meters away from a second of British Columbia’s four Parnassia species, Parnassia kotzebuei. Parnassia is another genus I am always thrilled to encounter, as it was one of the first dozen or so I learned to recognize in Manitoba. Parnassia fimbriata is native to much of western North America, where it grows in moist sites (fens, bogs, streamside, seeps, wet meadows) at elevations ranging from lowland to alpine. It is the tallest of these herbaceous species in British Columbia, occasionally reaching 50cm in height (though more typically 15 to 30cm). Parnassia kotzebuei, by comparison, is the shortest, ranging from 6-20cm. Parnassia is a reference to Mount Parnassus; Linnaeus applied the name to the genus based on an account in Materia Medica, a written work by the Greek physician Dioscorides (Dioscorides called it Agrostis En Parnasso). The Plants for a Future database contains a listing of historical medicinal uses for Parnassia palustris, the species thought to have been described by Dioscorides (who also said of it: “That which grows in Cilicia (which the inhabitants call cinna) inflames rude beasts if often fed on when it is moist”. 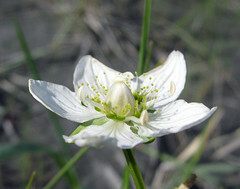 For additional photographs, see Calphotos: Parnassia fimbriata or Southwest Colorado Wildflowers: Parnassia fimbriata. I am more frightened by the rude beasts, all inflamed from grazing on Parnassia! i will be happy to by pass all the rude beasts! REALLY common at Nuk Tessli! Any idea what the appendages are for?